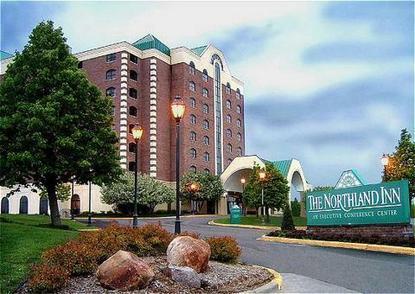 The Northland Inn is a smoke-free, all-suite Hotel and Conference Center located conveniently to area businesses and the fantastic shopping and dining of The Shoppes at Arbor Lakes. Extensive business and recreational services are readily available. Some of which include our indoor pool, hot tub and exercise room, as part of our Health Center, our Billiards Room, award-winning dining, Valet/Concierge services, Complimentary Shuttle, wireless internet access, and Business Center. The suites are some of the most spacious in the Upper Midwest. The traditional decor features a private bedroom with honey maple furnishings, warm, subtle lighting, large work desks with leather executive chairs, and oversized whirlpool bath for romance or relaxation. In the morning, enjoy freshly brewed coffee or tea and the USA Today newspaper delivered to your door. Each of our 231 newly renovated suites surround the eight story atrium and overlooks our America's Harvest restaurant and Atrium Lounge providing you with an excellent view from the interior walkway balcony.